when we moved into the new place, virago insisted on throwing out her old couch and getting something new. 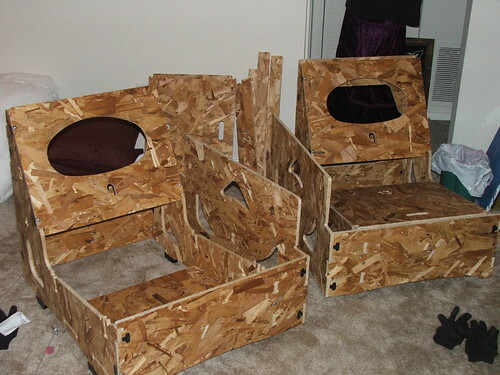 the old couch was perfectly sound structurally, but had a few large holes in the upholstery and smelled a bit like dog. personally i felt it would be easier to just keep the thing rather than figure out how to get rid of it, find a new one, and then figure out how to get that one to our new place. then my mother suggested home reserve. 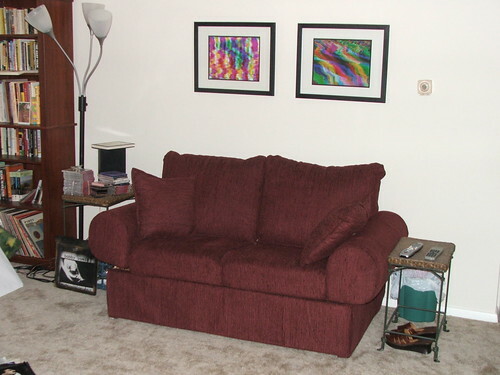 home reserve is a mail-order outfit (located in fort wayne, indiana) that makes couches, loveseats, chairs, and more. you assemble the furniture yourself out of jigsaw-like hunks of pressboard, and can later disassemble/reassemble it when it's time to move. they have 100 different fabrics to choose from, so if you get tired of one, you can order a new fabric and switch it up.